1: Nationalisation to Privatisation: 1945-79 – the Genesis of a Policy Idea. 2: The Conservative Party, Nationalisation and the 1979 General Election. 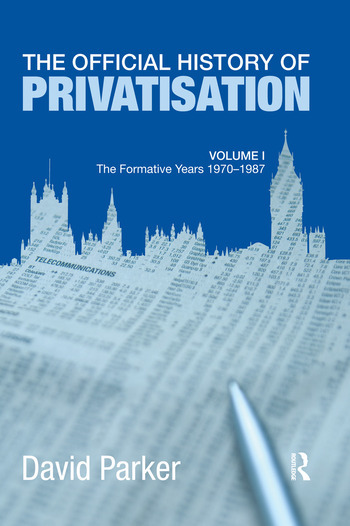 3: Balancing the Books: Privatisation and the 1979-83 Government. 4: Privatising Oil. 5: Privatising British Aerospace and Cable and Wireless. 6: Privatising Amersham International, the National Freight Corporation and Associated British Ports. 7: The First Four Years – A Retrospective. 8: Into the Heartlands of the Public Trading Sector: Privatisation and the 1983-7 Thatcher Government. 9: Privatising British Airways, Rolls-Royce, Shipbuilding and the Royal Dockyards. 10: Privatising Bus Transport and the Royal Ordnance Factories. 11: Privatising British Telecom: The Decision to Privatise. 12: Privatising British Telecom: OFTEL and Regulating Profits or Prices. 13: Privatising British Telecom: The Flotation and Repercussions. 14: The Privatisation of British Gas: The Decision to Privatise and Designing an Appropriate Regulatory Regime. 15: The Privatisation of British Gas: The Flotation and Aftermath. David Parker is Research Professor in Privatisation and Regulation in the School of Management, Cranfield University, UK. He has researched privatisation for over 25 years, and has acted as a consultant on privatisation internationally. Previous publications include co-authoring The International Handbook on Privatization.